Preparing baked goods with oil helps produce a moister, denser product but can add a significant amount of fat and calories. To lower the fat content in baked goods, the National Heart Lung and Blood Institute recommends substituting applesauce or prune puree for oil, shortening or lard in baked goods. Pureed banana works as a substitute in foods that can tolerate the fruit's strong flavor. Many baked good recipes, such as those for muffins, cakes and breads, call for oil as one of the main ingredients. Butter or shortening creates a fluffier, flakier product; oil produces a heavier end result. Substituting 1 cup of mashed banana for 1 cup of oil produces a similarly moist, dense product. One cup of safflower oil contains about 1,920 calories while a cup of mashed bananas contains about 200 calories. Oil contains beneficial amounts of vitamin E and fatty acids, but few other nutrients while bananas contain appreciable amounts of potassium, folate, vitamin C, vitamin A and other beneficial nutrients. Some recipes lend themselves to substitution better than others. Cakes with dense, fruity flavors, such as spice or carrot cake, mask the strong flavor of bananas better than lighter cakes, like white or lemon cake. Because banana bread already calls for mashed bananas, substituting puree for oil can create a heavy, soggy bread. Use three-fourths the amount of pureed fruit for the required amount of oil when substituting in recipes for rich, dense cakes and breads. To substitute mashed bananas for oil in recipes for lighter cakes and baked goods, try substituting half the amount of oil with the fruit puree. To substitute banana for butter, margarine or shortening, only use half as much substitute. Because oil interferes with the formation of gluten, fibers that form during the baking process, end products tend to be lighter and fluffier. 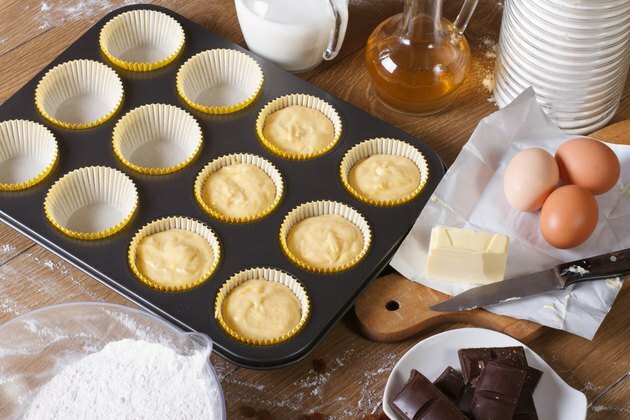 To prevent your baked goods from becoming tough and rubbery when using an oil substitute, choose a low-gluten flour, such as whole wheat pastry or oat flour, minimize mixing and reduce baking time by about 25 percent. What Can I Use in Place of Vegetable Oil for Cake Mix?